Lew and Huey is a brand that I look to when I want to talk about the potential success of the crowd funded marketplace. The brand began on Kickstarter, with multiple watches launched on that platform, all well received. I put the brand in the category of “friend of the site,” and they are always happy to send us information on upcoming watches and then lend us review copies when they are available. I first reviewed the Lew and Huey Phantom in April, and now I have a chance to take a two of the three options out for a test drive. Each of the three models offers an option for a brushed stainless or diamond like carbon (DLC) coated stainless 42mm case. There are strong similarities through the line-up, but there are also very distinct differences. 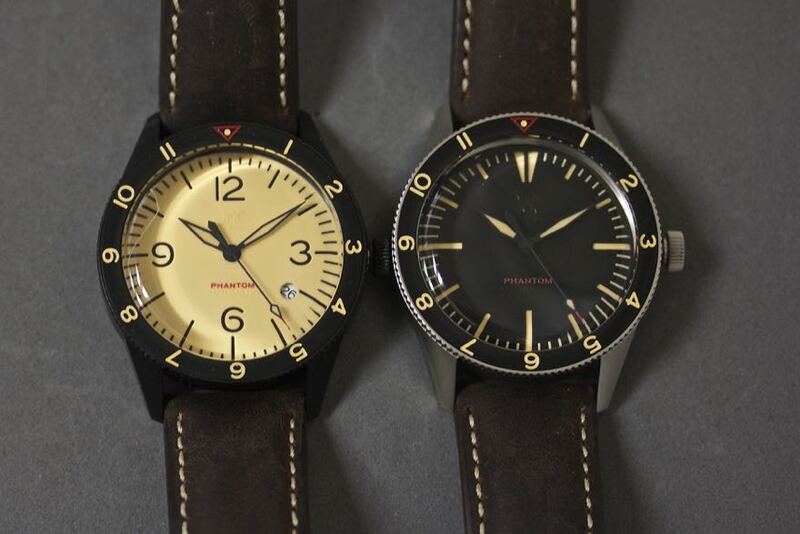 The two Phantom A styles both feature sandwich dials, with cut outs for the chapter ring and hour markers, but the black version puts the lume behind the cut outs, while the khaki version puts it up front. 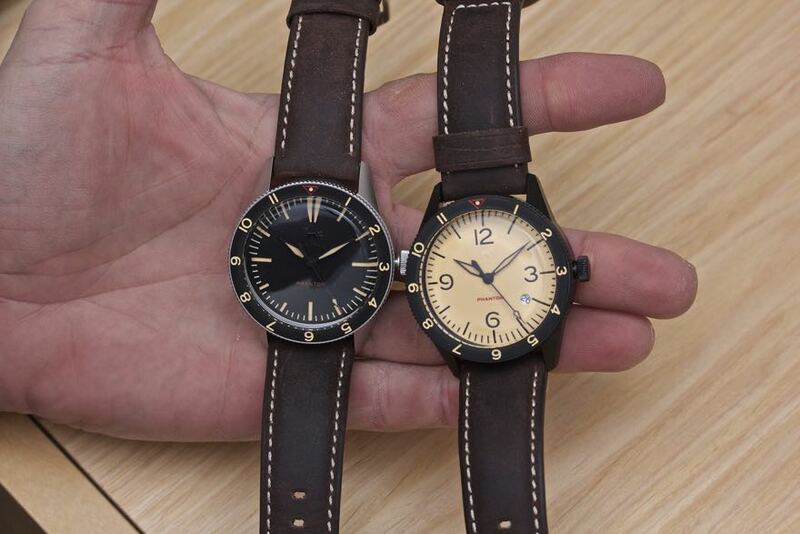 Short of something like an Indiglow quartz, the Lew and Huey Phantom A in khaki is going to be about as bright a watch as you are going to be able to buy. The Phantom B also goes with the sandwich construction and puts the lume in back, but deletes the numerals altogether. Departing from the more traditional pilot watches, the Lew and Huey Phantom includes a 60-click bi-directional bezel. 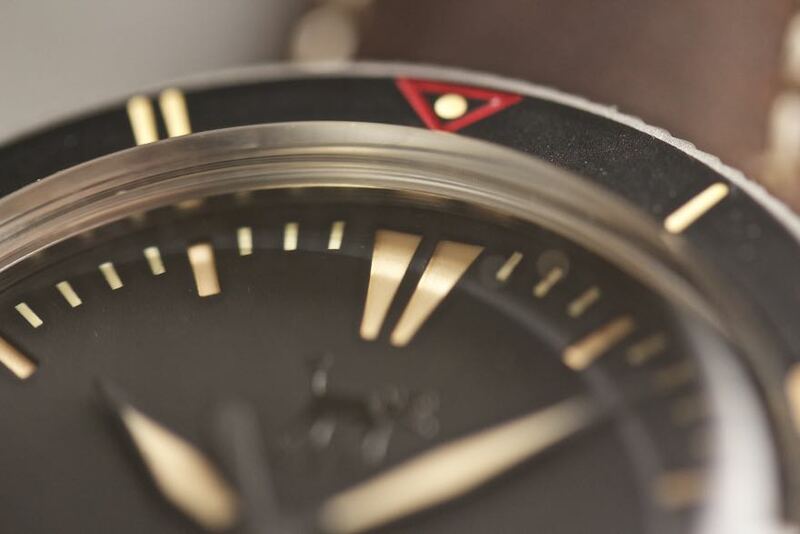 The bezels are well lumed along with the rest of the watch, with the numerals and the 12:00 dot nice and bright. The bezel turns freely but will stay put. 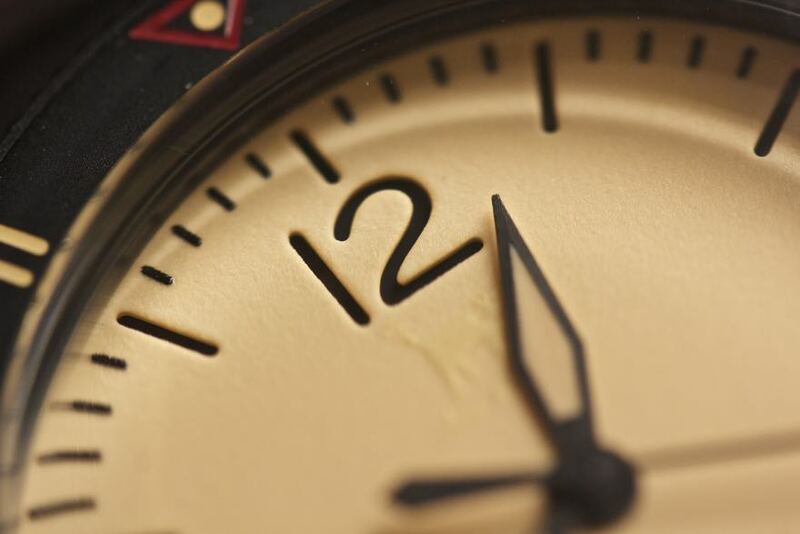 I would feel comfortable using for timing most things, but a uni-directional system would have been nice. Lew and Heuy intended for the bezel to be more used for tacking a second time zone than as a timing device. For a 60 click bezel, it locks in to the minute nicely, without a lot of play in the ring. 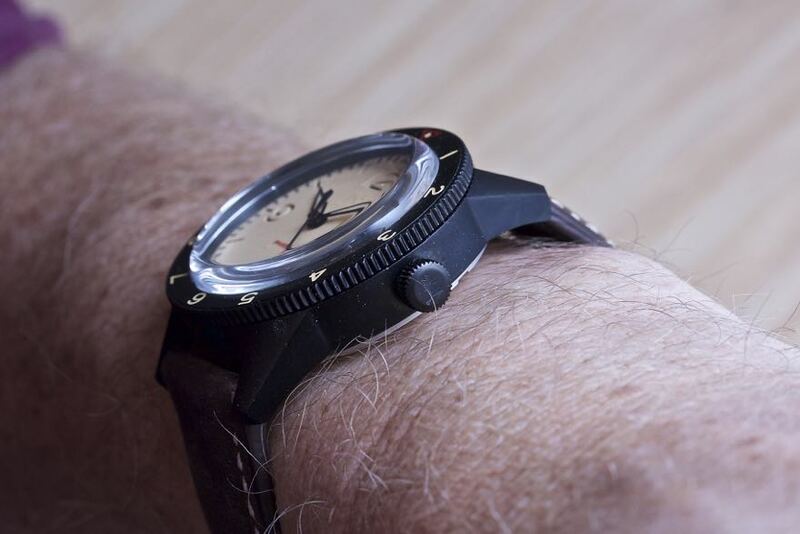 The coin edge makes it easy to grip, and it sits flush with the watch case. 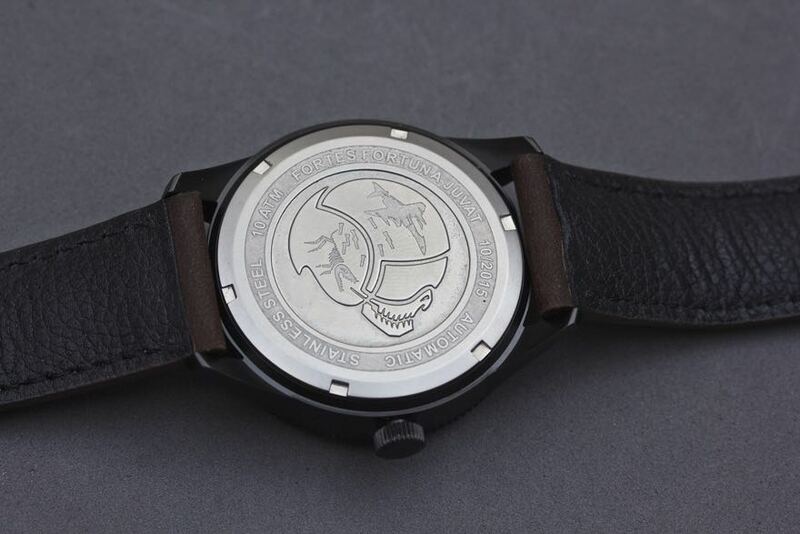 The caseback features a cool take on the logo, with a pilot’s helmet, the brand’s doggie as a skeleton, and the namesake Phantom jet. It also features the production date 10/2015, and the phrase “Fortune Favors the Bold,” just in case you need inspiration to make it through the day. On the wrist, the watch is nice and comfortable. It sits well and the distressed brown leather strap with contrasting stitching is thick, supple, and has a nice feel in the hand. One feature that is probably going to polarize a lot of opinions is the radically bubbled dome acrylic crystal. There is a lot of edge distortion, as you can see above, but I don’t mind that (except when I am trying to photograph the watch). Viewed straight on, the distortion is confined to the very edges, and at most normal viewing angles the distortion does not affect the readability of the watch. But it is there, and it contributes 3 mm to the 14mm overall height of the 42mm diameter watch. I really like the look of the sandwich dial on both versions. 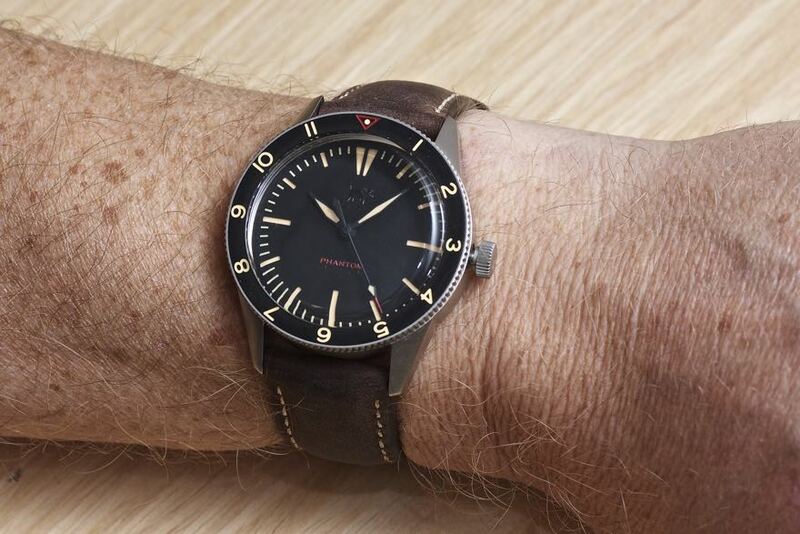 Overall, I prefer the A style, with the Arabic numerals, but I am not sure if I would prefer the lume up front in the khaki version or behind the dial as with the black. 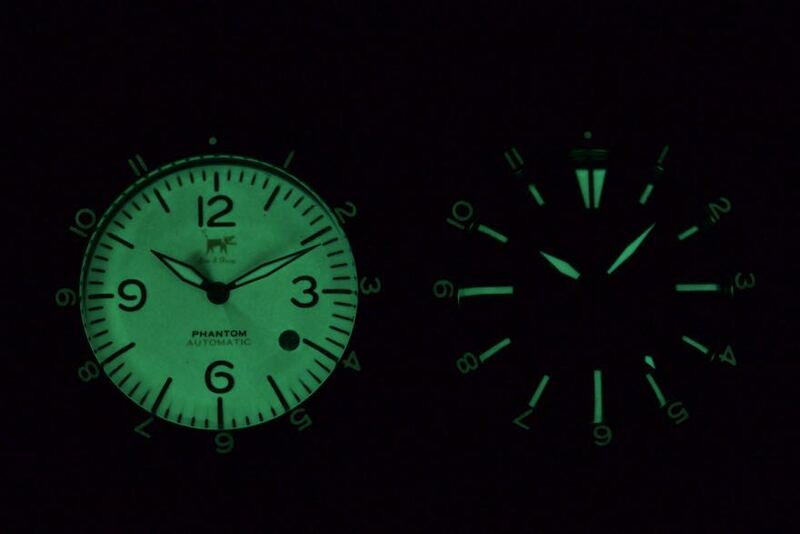 When I am tired, the lumed hands tend to blend in a little bit with the lumed dial of the khaki version; it might have been better to omit the lume on the hands since you don’t need it to read the watch. The font used for the A style is very attractive, and the cut out for both the A and B styles are very well done. Driving the watch is a Seiko NH35 automatic movement, a very reliable movement with hacking. The B style I had omitted the date wheel, which I think would work well on the A style as well. In both cases, you get to choose if you want the window or not, which is a really welcome option for customization. All three versions are also available in either brushed stainless or black DLC (add $25) finishes. Though my test model did not have it, the DLC watches are stated to ship with DLC hardware on the strap. Note: some minor edits were made based on feedback from Lew and Huey. Price: $450 – $490 depending on style and finish. 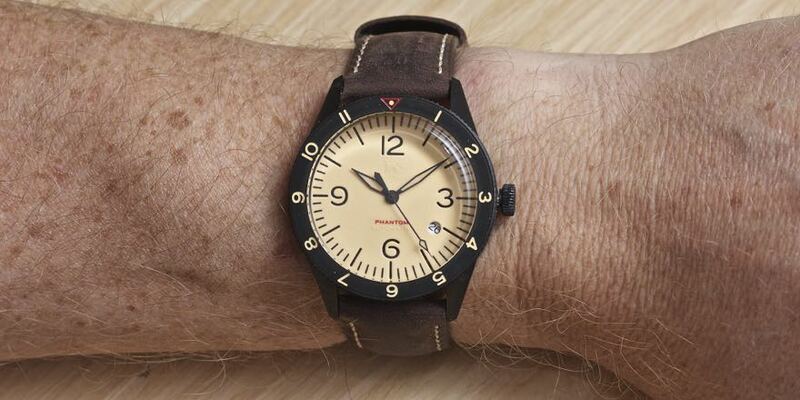 Who we think it might be for: You want a modern looking pilot’s watch with some traditional cues. Would I wear one myself based on what I’ve seen? : Yes, this is my favorite Lew and Huey yet. If I could make one design suggestion, it would be: Unidirectional bezel. What spoke to me the most about this watch: I like the overall look, and the sandwich dial is very sharp. This watch is a blatant rip off of the Bell and ross heritage model. A friend of mine bought the lew and huey orthos and encountered a problem with the movement. The owner of Lew Huey Chris Vail refused to give him a refund. Would recommend that you do your research before you buy what is essentially a replica watch here. Re: movement problems – that’s not good to hear.